Sometimes all you need after a long day is some time to yourself so that you may gather your thoughts and prepare to seize another day, and there’s pretty much no better place to do that than in a relaxing bath. The bathtub is almost a universal symbol of sweet relief for women — the place where we can hope to catch a few moments of peace and quiet and just be, at least for a little while. Not only can a hot bath rejuvenate your mental well-being, it can also work some serious magic on your skin. 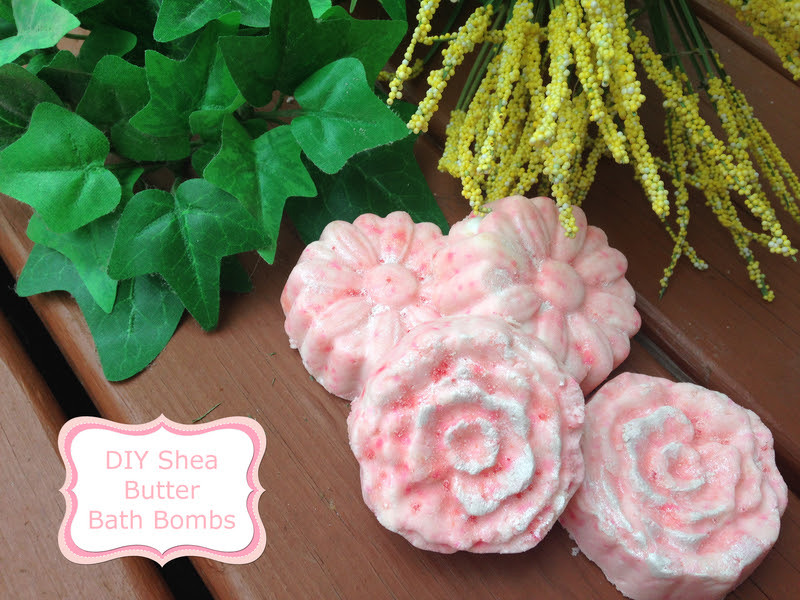 Lifestyle expert Jasmine Stringer of carpediemwithjasmine.com has created an awesome Shea butter bath bombs recipe we’re thrilled to be able to share with you. If winter dried out your skin, you’re going to want to take the afternoon to whip up these ultra-moisturizing little beauties! To make these bath bombs successfully, it is important to have your ingredients measured out and ready to mix, so do that first. Combine and stir the baking soda, citric acid, cornstarch, and powdered milk in a medium-sized bowl. Set aside. Melt the Shea butter along with the oil and honey in a small pot over low heat. Add the melted ingredients to the dry mixture and whisk until thoroughly combined. For an enhanced spa feel and fragrance, add a few drops of your favorite essential oil. Mix well. The ingredients should begin to hold together. Working quickly, use your hands to press the mix firmly into the plastic sheet mold. Leave the mixture in the mold for a couple of minutes and then pop out. The easiest way to work with plastic candy sheet molds for this recipe is to put a cookie sheet over the tray, flip the tray over, and then lift the mold off. While one tray is drying, work on the next. Let the bath bombs dry overnight. The next day, place them in a decorative bag or basket and place them in your bathroom. To use, drop 1 or 2 bombs into your tub and let the tranquility wash over you — and moisturize you in the process! You can also turn this mixture into a loose bath powder. Simply leave the mixture in your mixing bowl for 24 hours and periodically mix the ingredients to break up the clumps. Once all of the moisture is gone, place the powder into a mason jar. For a decorative touch, tie a colorful ribbon that matches your bathroom theme or colors around the jar. This post was compiled by the staff of Woman Tribune. I have never done bath bombs at home. It would be a really cool party favor or something to add to pamper yourself during me-times at home! Thanks for sharing the recipe! Those are so cute. I would love to have some on hand to share with guests or to give as gifts! I have a friend that makes his own bath bombs and sells them at the local market. Didn’t realize it was so easy to do! These are so pretty, I wanna try this at home it looks fun and easy to do.